Since The Vader Project debuted at Celebration IV, and with additional UK-based artists on board travelling to Celebration Europe, it only made sense for popular exhibit to show at San Diego Comic-Con International. 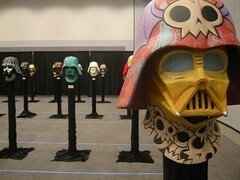 Along with legendary artists such as Shag, Paul Frank Sunich, Tim Biskup, Gary Baseman, Niagara and J. Otto Seibold, the design duo known as Urban Medium made sure to put its special signature look on one of the many Darth Vader helmets showcased in The Vader Project art show debuting at Star Wars: Celebration IV. Star Wars fans in the know, may already be familiar with Urban Design’s clever mash-up sticker of Che Guevara and a stormtrooper aptly named “CheTrooper.” Artist Derek Fridman gave us the low down on the Urban Medium Darth Vader helmet. 1. Why did you decide to participate in The Vader Project? There really wasn’t a need to think about whether or not we’d do it. The minute we were asked we said ‘YES’ — if you’ve seen our art, you know just how much of an influence Star Wars has had on what it is we do, there was no doubt in our minds. We are truly honored to participate in what is the absolute ultimate artist platform show. 2. How did you customize the helmet with your own Urban Medium Design style? The design of the helmet on its own is an amazing work of art, so our goal wasn’t to reinvent or deconstruct it, but create a modern interpretation of it that had something of a royal ‘haute couture’ look. Think Vader on the runway at New York Fashion Week. Heather and I decided that the best approach for us would be to do what we would traditionally do out in the street, just on a much smaller scale. We decided to go with the theme of good vs. evil — capturing the light vs. dark side struggle Anakin faces throughout his life. One half of the helmet represents the light-side of the Force, pasted with white floral patterns of Rebel Alliance logos and remixed characters DJ-D2 and Chewbacca. The other half represents the dark side, pasted with black floral Imperial logo’s and remixed characters Boba Fett, and B-Boy stormtroopers. And since platinum is so last year, we finished the helmet off with gold splats and details. Absolutely — now if he’d only send us his measurements we’d create the matching suit. 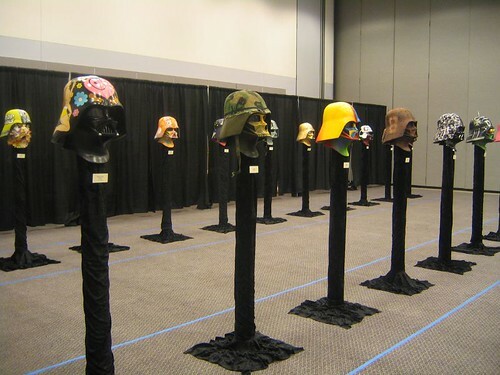 Watch the video tour of The Vader Project exhibit. 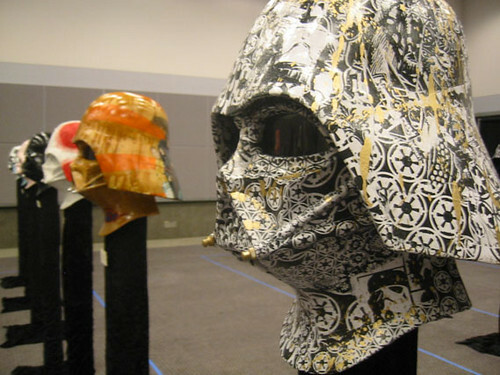 To see the Urban Medium helmet and many others, see all of our photos of The Vader Project exhibit here. For more information on The Vader Project, click here. And be sure to check out The Vader Project profile here on Myspace.com. Walking through The Vader Project exhibit at Celebration IV is like taking a stroll through a Darth Vader tribute done by the coolest lowbrow and urban artists on the planet. Frank Kozik, Paul Frank Sunich, Marc Ecko and Urban Medium (among numerous others) gave Darth Vader’s helmet a hipster makeover. As fans walk through the exhibit they can see the artist’s own unique style featured on each helmet. Whether it’s a Tiki-inspired design from Shag or a girlie 1940’s style pinup from Marc Ecko — it’s apparent each artist took time to pay special tribute to the headwear of the Sith. To see O’Connell’s helmet and many others, see all of our photos of The Vader Project exhibit here. You are currently browsing the archives for the The Vader Project category.